A walk round Rethimnon Walk and Cycle in Crete . Allow at least three hours for this walk. Do not try to cycle round. 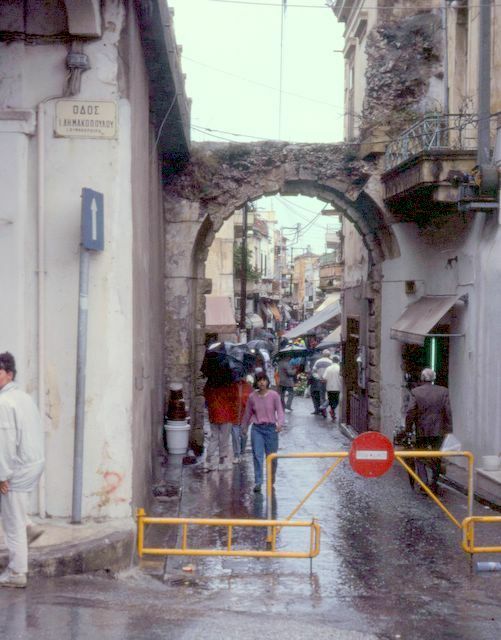 Enter Rethimnon by the single stone arched gateway into the market street, Konstantinoupolis. On your left the fine worked stone of an old church emerges from the rubble and concrete walls of newer buildings. Turn left where the street forks for a look into the Nerandez Mosque with its three domes supported by a series of arches. It is now used as a meeting hall and for concerts. The minaret is closed because of damage to its top. 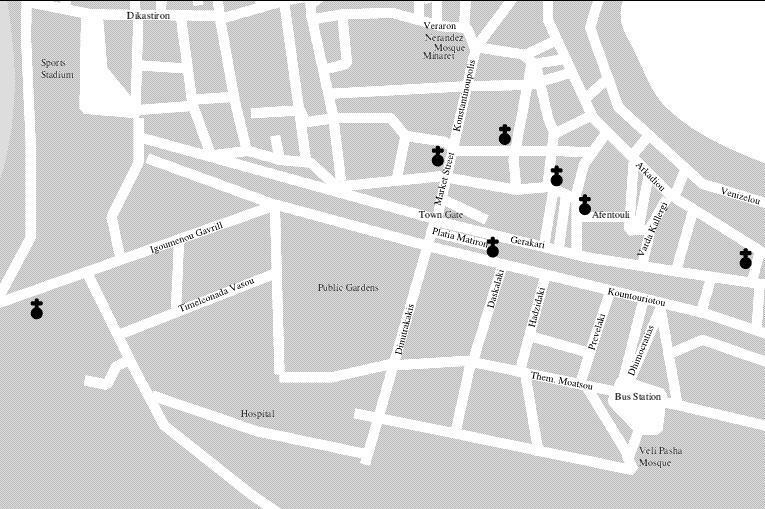 Continue down this street past several derelict Venetian buildings and turn right by the Taverna Kamapa. Cross Theod. Arambatzoglou street, turn right into the next and continue to the end of this street. It is worth looking inside the bars and tavernas that line these streets as they occupy some splendid vaulted rooms with ancient doors. They often have courtyards hidden from the street. 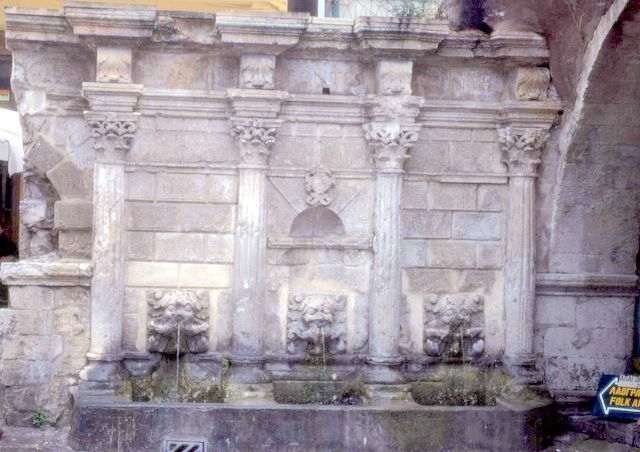 Turn right and then left to the Arimondi fountain and the Venetian Loggia. Turn north from the fountain along Messologia, pass the Catholic church and turn left at the end of this street away from the sea. Almost immediately turn right into ODOS.ARGUROPOULWN, a narrow alley that leads to a flight of steps. Climb these, round the corner, and the fort's ramparts are revealed. Entry to the Venetian Fortress costs 200 drm. Beware of unprotected drops and holes in the ground and do not let children run round. The tunnel entrance is disappointing as the guard rooms to the side are used as store rooms and are not open to the public. Climb the steps on your left beyond the tunnel for a view of the town over the ramparts. Two minarets stand out over a jumble of roofs. A new amphitheatre occupies the south bastion from where a doorway leads to a sloping tunnel down to a well. The apertures in the bastion wall for cannon are unprotected. A vaulted hall in the west bastion has a small fireplace at the far end but no other features of note. The gate in the west wall enters the fort by a dog leg and would originally have had a vaulted roof but in contrast the north gate with its flight of steps seems a very weak point in the bastion. The vaulted storerooms under the north bastion would be of more interest if they were cleared of rubbish. 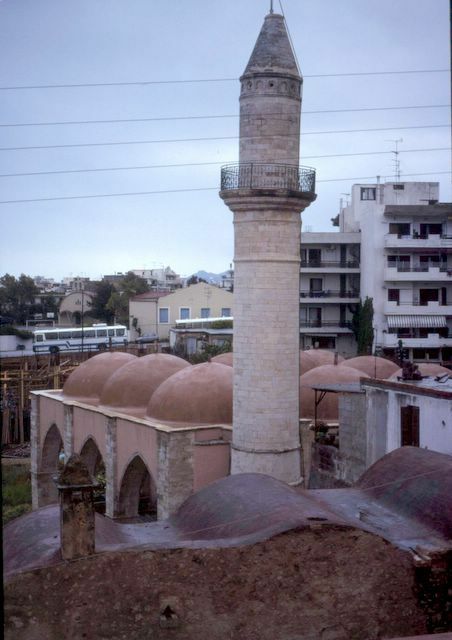 The single dome of the mosque is supported by eight arches on a square base. Only the very base of the minaret steps remain but the wear on these shows their prolonged use. The eastern end of the fortress has several buildings with some fine stone vaulting. The little church here has pointed arches supporting a vaulted roof. Leave the fortress by the main gate , keeping to the right to head east down a narrow alley to emerge by the Catholic church again. Continue with this church on your left along ODOS SALAMINOZ. The little square here has an interesting collection of old shutters on its windows. Turn right at the end of this street and then left down the narrow "alley of the fish" towards the lighthouse ahead. Turn right along the side of the Venetian harbour and pass a long line of fish restaurants. Their prices are very expensive and the waiters very determined that you should sit down and eat, but they do not persist if you decline their invitations. The sea front to the east of here is one long line of restaurants, but the street behind, Arkadiou, has a lot more of interest to see. 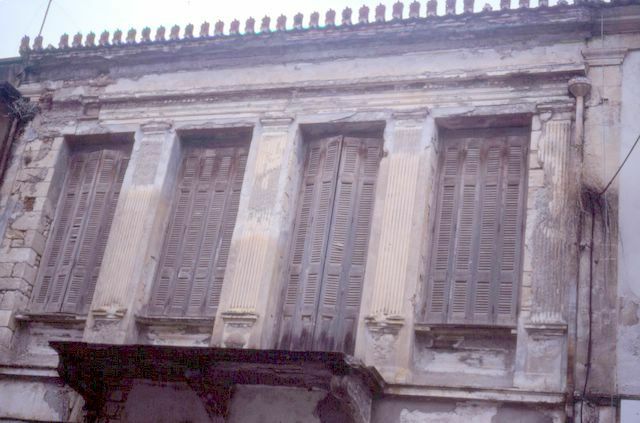 Many of the buildings along Arkadiou are old with fine carved doorways, some with inscriptions. Several are modernised at street level but are derelict above. 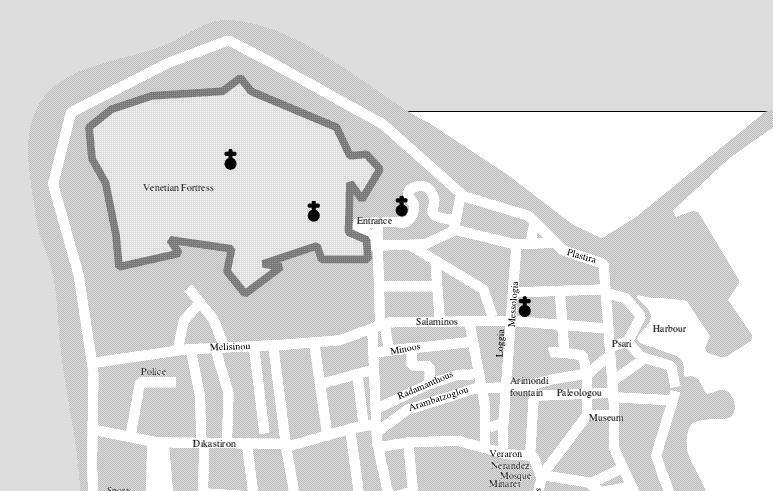 Continue east until a cluster of small domes just before Iroon square and then turn right up to the main road. Head back west along Kountouriotou until you reach the statue of Venizelos, then head south past the bus station along Dhimocratias to the Veli Pasha Mosque. This building is closed while it is being reconstructed. Go up the alley to the west where you can get the best views of the minaret and the nine domes from a chicken run or from the block of flats above.